If your requirements are exclusive get-togethers where organic architecture is seamlessly integrated with innovative conferencing & multi media technology, you will not be disappointed. 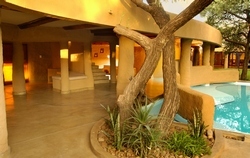 Situated just more than an hour's drive from central Johannesburg and only 45 min from Pretoria. Didimala Game Lodge was created from 10,000 wheat straw bales and is probably the largest structure of its kind ever embarked on. The use of modern, contemporary decor and furniture set against a backdrop of these rugged buttresses create distinctive contrasts. The uniqueness of Didimala was recognised when it was selected to host the World Summit on Progressive Governance in Feb 2006. Several heads-of-state attended the conference, including President Thabo Mbeki, Prime Minister Tony Blair and Nelson Mandela.